Open Sound Control (OSC) is a UDP network based communications protocol... Old Man MIDI's millennial nephew on steroids. And if you're reading this page we'll assume you already know Quartz Composer; the much loved by users, much neglected by Apple, free patch programming application that is both fast and flexible however always lacked properly working OSC support. Et voila! Hexler presents to you our free OSC plug-in: Control your Quartz Composer patch with any OSC sequencer, source, or custom made TouchOSC interface. This plug-in was created because there seems to be a problem with the built-in OSC receiver in QC that would sometimes output 0's instead of the last received numeric value, causing something best described as "stuttering" when used with a visual output. Our qcOSC plug-in automatically creates new outlets when receiving messages and advertises its input ports via Zeroconf (otherwise known as Bonjour in Apple-land). 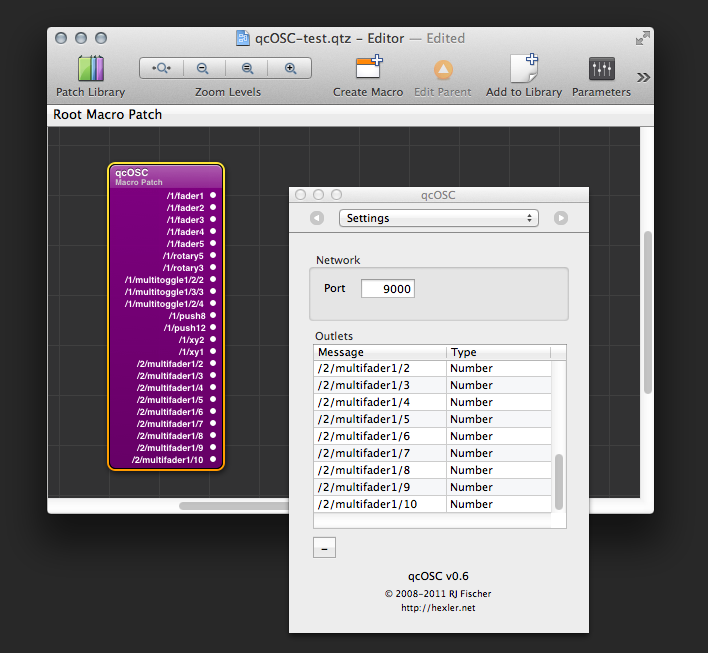 Drag a qcOSC instance into your composition. Open the Patch Inspector (Command+i), goto Settings and enter a Port number for the plug-in to start listening on. Send any OSC message(s) from your control surface or sequencer. Enjoy! The downloads below are free for anyone to use. If you have any issues please contact us, however as Quartz Composer is no longer officially maintained by Apple, and this plug-in is therefore no longer maintained by Hexler, we cannot guarantee qcOSC will work on increasingly modern versions of OS X.